Atlantans love getting outdoors. Whether you find yourself sitting on the lawn at an outdoor movie festival, exploring the city’s natural side on its many hiking and biking trails, or tubing down the Chattahoochee, the great outdoors call Atlanta residents regularly. Unfortunately, with all the natural wonders come some creepy crawly friends that are less than welcome. While Georgia is home to many different species of spiders, most of which are harmless and won’t cause more than a small bump if you’re bitten, the Brown Recluse and Black Widow spiders, two poisonous spiders, are also Georgia dwellers. And these spiders don’t discriminate between city and nature. Henning Von Schmeling, senior director of operations for the Chattahoochee Nature Center, provided the following information on the poisonous spiders in Georgia. Straight out of haunted tales and Halloween décor, the Black Widow spider is worthy of its infamous reputation. Not only are they considered to be the most venomous spiders in North America, but they can also be violent when in fear of attack and are always guarding their webs. When the Black Widow sees something coming into contact with its web, they will come out of their hiding spot, usually cool, moist, and dark areas, and bite. Von Schmeling recommends looking into any areas like this before retrieving anything with your hands. Black Widow spiders are a glossy black color and can be easily identified by a red, hourglass shape on its abdomen, says Von Schmeling. Aside from its iconic appearance, you can identify a black widow’s presence by its webs, which are the largest webs of all web-spinning spiders. "Black Widows make a messy web with trigger lines radiating outwards,” says Von Schmeling. What Does a Black Widow Bite Look Like? 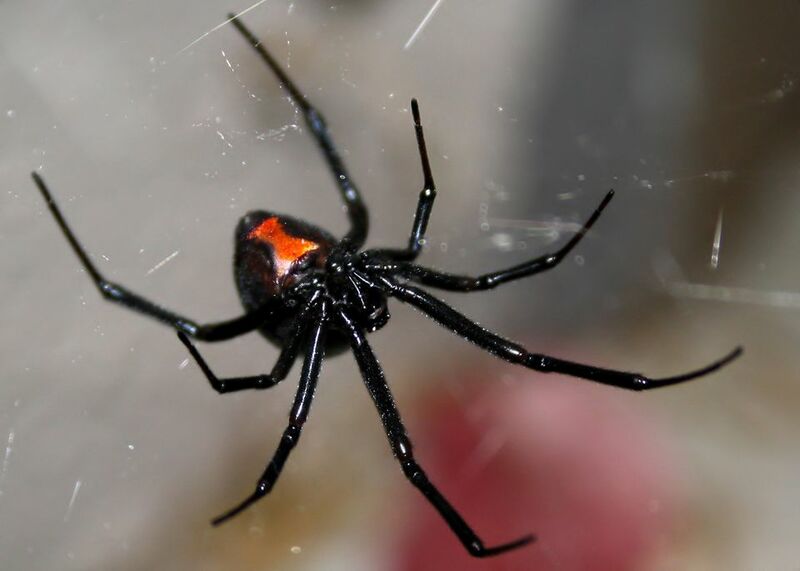 A Black Widow bite consists of two easily identifiable symptoms: The site of the bite will have two small fang marks and will immediately be followed by a noticeable, sharp pain, and will become red and swollen. If you don’t notice these indicators but begin to experience muscle cramps, chills, fever, nausea, and severe bodily pain, contact your physician immediately. Black Widows have a protein in their venom that attacks a victim’s nervous system. Each person will react differently to the bite, and according to WebMD, life-threatening reactions are only ever seen in children and the elderly. Though less aggressive than the Black Widow, Brown Recluse spiders, which are no more than the size of a quarter, have venom capable of causing severe damage to your skin. Brown Recluses live in dark, hot, and dry areas (think old barns, abandoned houses, and hot attics). “They will also make a fairly messy web, but [unlike the Black Widow, they] do not hide out,” Von Schmeling explains. Ranging in color from a dull yellow to mud-like dark brown, the Brown Recluse can be identified by a violin-shaped pattern on its neck. According to Von Schmeling, other species of non-threatening spiders might have similar markings on their backs, so the telltale sign of a Brown Recluse spider is the pattern of its eyes. These spiders have six eyes that are set apart in three pairs along their face. Brown Recluse spider bites don’t always hurt or show immediate symptoms, making them harder to identify than a Black Widow bite. Keep an eye out for red, swollen skin around the bite that might develop a blister. This area will also begin to itch. Within a week of the bite, the sore might begin to develop an open ulcer. Seek out medical treatment immediately if this happens, as you could develop a red rash all over your body, warns WebMD. Some people will experience a severe reaction from the bite that leads to the destruction of red blood cells, which can cause severe anemia. If you have a spider bite that you suspect is from one of these spiders, remain calm and contact your physician. Because the venom from the Black Widow and Brown Recluse can cause painful symptoms throughout the body, do everything possible to help your doctor make a positive identification of the species. While reading about these spiders might just be hair-raising on its own, Von Schmeling recommends catching the spider and taking it with you to the doctor, or take a high-quality photo of the spider to help them identify it. Your doctor will likely treat a Black Widow spider bite with narcotic pain relief and muscle relaxers, according to WebMD. In more severe cases, an antivenin (or antivenom) will be used to help relieve symptoms. If the bite is not treated, your symptoms will remain painful for many days, but should not be life-threatening. If a Brown Recluse bites you and your bite does not develop an open sore, you should apply a cold compress and keep the bitten area elevated. However, if the bite develops into an ulcer, you can develop serious skin problems, similar to the MRSA infection, if the bite is left untreated. Your doctor may remove the dead skin from the area and apply skin grafts, if necessary. While seeing these spiders in your home can easily cause panic, it’s important to remain calm. If you only see one spider, Von Schmeling suggests capturing and releasing it into a suitable habitat, such as any nearby wooded area. However, if you want to avoid coming into contact with the venom at all costs, you can also try vacuuming up the spider. It will most likely die being brushed up by the vacuum, and if for some reason it survives, Von Schmeling assures us that the chances are slim they’ll find their way back out. If you find many of these creepy crawlers in your home, rest assured they can be easily removed by most extermination services. But if you come into contact with these spiders in nature, leave them be and appreciate their place in the ecosystem. Both of these spiders prey on various insects, including disease-ridden mosquitoes and plant-eating beetles, which can be nuisances to humans.